Mark was inspired to write the title song after meditating on Psalm 118. Tradition says this psalm was sung during the Passover feast. So Jesus probably sang this the night before he was crucified. The words were true for him then, and they are still true for us today! Look closely on the cover. 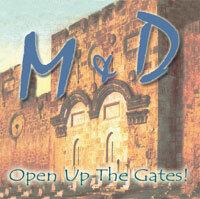 That’s an actual picture of the Eastern gate (taken in the early 1900’s) where Jesus will be coming back thru. Yes, those are gravestones right in front of the doors. This CD was our first project and most of it was written while were were ministering for a month down in Bismarck, ND when everything that could go wrong did go wrong. It’s a prophetic work, and lots of stuff goes on in the spirit (thus, track #7). 10 Are You A Christian?